Non-fiction – paperback; Penguin; 288 pages; 2011. 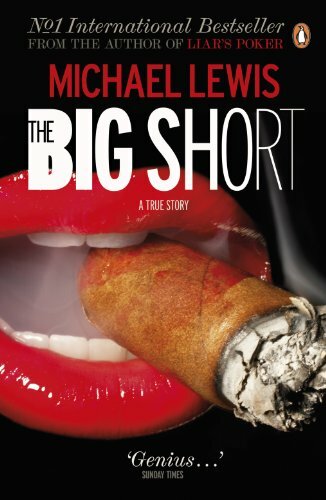 Back in February I bought The Big Short for Mr Reading Matters, because I knew he had loved Michael Lewis’s Liar’s Poker many moons ago. Then, a few days later, I saw a review of the book on Material Witness, and decided I might like to read the book myself. First things first. I am not a numbers person. I am not a finance person. I do not understand the inner-workings, or even the outer-workings, of Wall Street. But back in October 2005, Mr Reading Matters and I had a personal tour of the New York Stock Exchange, and I remember coming out of the building feeling slightly dizzy: I couldn’t get my head around the fact that we’d just been given an inside glimpse of the beating heart of capitalism. Fast forward three years, and that beating heart seemed to be in cardiac arrest. And it wasn’t just in New York; the financial crisis swept through other places around the globe, including London, Iceland, Ireland, Greece and Portugal. Michael Lewis’s book is not about the crisis per se. It’s not an academic analysis of what happened. Instead, he takes three people working within the financial system in the USA at the time, and tells their stories, namely of how they “predicted” the events that unfolded and set out to make money from it by betting against the market falling when everyone else seemed completely oblivious to the risks up ahead. Along the way, these people — hedge-fund manager Steve Eisman, Deutsche Bank trader Greg Lippmann and former neurologist turned capitalist Dr Michael Burry — tried to warn Wall Street of what looked like the imminent collapse of the market, but no one listened: they were too busy making money. It’s a compelling read, because Lewis turns what could have been a rather dull story about economics into an edge-of-the-seat drama about humans: their greed, their arrogance, their immorality and their intelligence (or lack thereof). And he paints particularly interesting portraits of the naysayers — Eisman, Lippmann and Burry — who were all clearly “outsiders” and non-conformists and had particular anti-social “quirks” that ultimately worked to their advantage. Lewis writes in an engaging straightforward style, using plain English and simple analogies to cut through the jargon, so that even the most non-financially minded of us can understand concepts like “sub-prime mortgages” and “credit default swaps”. I read the book in the space of a weekend, getting more and more angry at the collusion between the hedge-fund managers, the ratings agencies, the big banks and the bankers to rip-off ordinary people, in particular, poor immigrant workers who were given access to huge mortgages they could never possibly pay off. Meanwhile, those “working the system” walked away with millions. The Big Short is a book about fraud — and subterfuge — of the highest order. As an aside, I watched the Oscar-winning documentary Inside Job a few days after finishing Lewis’s book. It’s another take on the crisis, but compliments The Big Short very nicely. I couldn’t recommend it highly enough for anyone wanting to understand the corruption at the heart of the financial services industry in the USA. The Big Short: Inside the Doomsday Machine was shortlisted for the 2010 Financial Times and Goldman Sachs Business Book of the Year Award. Agreed. Great book about how the bankers walked away with all our money. You said it made you angry (it made me angry too), but I found bits of it very witty too. If only all non-fiction was as well written as this one.